Co-Founder and Mentor, Concerned Children and Youth Association, Uganda. Angelina is a United Nations Peace Prize winner of 1998. Her daughter Charlotte Awino (who is a member of CCYA) was abducted by the Lord’s Resistance Army on October 10th 1996 and remained captive for 7 years. 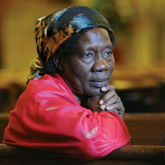 Angelina Atyam co-founded the Concerned Parents Association (CPA) Uganda and was a key person in the advocacy for the unconditional release of children and youth abducted by the Lord’s Resistance Army.